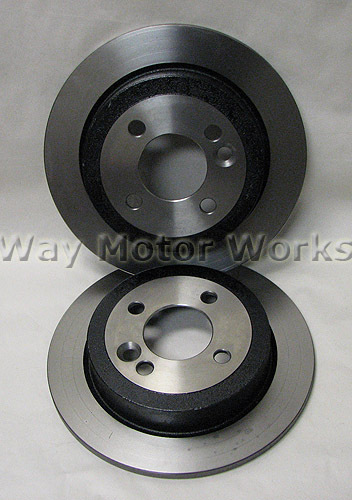 TSW plain face rotors for 2002-2006 R50 R53 MINI Cooper and Cooper S, and 2005-2008 R52 MINI Convertible. These brake rotors are the same quality as the famous slotted TSW rotors, just a little cheaper as they don't have the slots. Made from high carbon steel. Hats on these also come painted so they won't rust. Sold in front pair, rear pair, or set of 4. Picture is of rear rotors.